Join Clinton River Area Mountain Bike Association (CRAMBA) at River Bends Parks on Saturday, June 3rd 2017 from 11 to 2 to celebrate Take a Kid Mountain Biking Day! 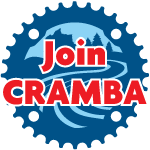 CRAMBA, local bike shops and other trail enthusiasts will be on hand to help conduct skills development, perform bike/gear checks (safety checks), bike and helmet fittings as well as introduce Leave No Trace principles. A couple of course offerings will be marked on the single track trail, which will provide youngsters with appropriate skills challenges and distances for a variety of abilities and ages. Our National Mountain Bike Patrol will be onsite, and the word on the street is they will be grilling up some lunch for everyone (that is until they run out of food). Riding with your child will help promote both the great sport of mountain biking and an appreciation for out great outdoors. Come join us for a great day out on one of our local trails! Please feel free to follow us on our Facebook page, where we will continue to have updates of trail conditions and chapter events, including Take a Kid Mountain Biking Day. Although we do not see anything that would force us to cancel this event, our Facebook page (https://www.facebook.com/crambaimba) and website (http://www.cramba.org/) will post if there is a need to cancel due to weather or other situations that may arise. For more event information, please check out the following IMBA (International Mountain Bicycling Association) link: https://www.imba.com/kids . If you have questions, concerns or wishes, please contact us at info@cramba.org .